By tetrapodzoology on May 16, 2011. On March 14th 2011 National Geographic screened episode 1 of their new series Wild Case Files (here in the UK, the episode was screened on April 11th), and the reason I'm writing about it is because I featured in said episode. The first section of the show was devoted to an investigation of the 'Montauk monster'. They provided a potted history of the whole 'Montauk monster' story, spoke to all the main characters involved, and ended with me explaining how the carcasses (both the original, July 2008 specimen, and the 'Clapsadle carcass' of May 2009 and 'Gurney's Inn monster' of September 2009 [shown here]) are - without any doubt whatsoever - actually partially decomposed Raccoons Procyon lotor. Tet Zoo appeared very briefly on-screen, and of course my association with the 'Montauk monster' is itself a consequence of my writing about it on Tet Zoo. All in all, it thus seems appropriate to discuss the TV show here. Thanks to Tigress Productions for permission to use the screen-grabs. For the few readers who might be hearing the whole 'the Montauk monster is a dead raccoon' thing for the first time, let me say that the raccoon identification is not whimsical or speculative: it's based on the extremely obvious, detailed skull anatomy of the carcasses and also on numerous other bits of evidence (like the size and proportions of the carcasses, their coat colour, unusual hand anatomy and so on). The 'peculiar' look of the carcasses - where the snout, lower jaw and/or entire head is defleshed and the body is mostly or entirely naked skinned - is not peculiar at all but absolutely typical of mammal carcasses that have been decomposing in water for a few weeks. As Wild Case Files concluded, it's CASE CLOSED: the raccoon identification is definitive. So, hats off to Wild Case Files (and National Geographic, and Tigress Productions) for promoting rationality and an evidence-led approach in their coverage: if only this attitude was more frequently encountered in the mainstream media. It might not seem like a big deal, but I consider it a significant score as goes public outreach. If you're a regular Tet Zoo reader you'll know that I've said all of this before. People who continue to promote the idea that "scientists have yet to explain" what the carcasses are clearly have an interest in perpetuating the mystery, presumably for personal financial gain. For the record, I've said all along that the raccoon idea is not 'mine': other people came to the same conclusion before I did, and it was discussed online at such sources as Loren Coleman's Cryptomundo before I got round to writing about it. Worth noting is that one of the illustrations I've become associated with - the one showing a recently deceased raccoon superimposed over the original Montauk monster photograph [below] - is not mine either (not that I've ever said that it was). So far, there don't really appear to have been any sour grapes over the fact that I've been singled out as 'the guy' who identified the carcasses, but it's probably true that my Ph.D. and other qualifications helped make me seem like a reliable and relevant 'expert'. I'm not an expert on raccoons, or on the wildlife of Long Island, but my knowledge of anatomy and of animal diversity - all part and parcel of being a palaeozoologist - definitely makes me a useful person to know when it comes to the identification of weird carcasses. My personal interest in cryptozoology and 'monster carcasses' definitely helps too. I also consider myself fairly experienced in what's known as actualistic taphonomy: that is, observing the decomposition and dissemination of animal carcasses and skeletons in the field. There isn't a huge amount of existing literature on that subject (a select few good references include Coe (1978), Weigelt (1989) and Carter et al. (2007)), so to be experienced you have to get out there and see it in action for yourself. Anyway, Wild Case Files featured me as the expert who put a rational anatomical/biological perspective on the Montauk monster case. I feature throughout the segment, and there are lots of wonderful promotional shots of my research group's building and lab at the University of Portmouth (I really hope they appreciate all the publicity). I was shown debunking the Panamanian 'Blue Hill monster', or 'Cerro Azul monster', as well (see adjacent screen-shot: I'm pointing to the 'Blue Hill monster's' head). While I'm more than happy with the way I was portrayed and the way in which my argument was presented, I'm slightly disappointed that they didn't include the sequence where I compared the details of the 2008 carcass with a raccoon skeleton. Prior to filming, we went to great efforts to get hold of a raccoon skull - unfortunately though, we couldn't get hold of it in time. It then turned out that an entire mounted raccoon skeleton was sitting in Bob Loveridge's office (the office next to the lab where we did the filming). You see the skeleton several times during the episode: in the screen-shot below, it's the large skeleton to my right. Having this skeleton to hand gave me exactly the chance I wanted to show how raccoon skull shape, tooth configuration and so on is absolutely identical to what's seen in the Montauk monster carcasses (the skeleton's limb proportions also matched those of the carcasses. As I've said before, claims that raccoons are "not leggy enough" to match the carcasses are incorrect). The fact that this scene didn't make the final cut means, I suppose, that the other details I gave were already convincing enough. Anyway, if you saw the episode, I hope you enjoyed 'my' segment, and if you haven't seen it and get the chance to, you'll enjoy it if you're a Tet Zoo fan and/or reader. The relevant segment can't be seen online, yet, but there's a brief promotional version of the episode here. The other stuff they featured was also very interesting: a human fatality caused by an angry moose and die-offs of Serengeti lions caused by canine distemper. For an episode guide to the whole series, go here. Thanks again to everyone at Tigress Productions for their co-operation and for approaching me in the first place. What was the Montauk monster? Carter, D. O., Yellowlees, D. & Tibbett, M. 2007. Cadaver decomposition in terrestrial ecosystems. Naturwissenschaften 94, 12-24. Coe, M. 1978. The decomposition of elephant carcases in the Tsavo (East) National Park, Keyna. Journal of Arid Environments 1, 71-86. Weigelt, J. 1989. Recent Vertebrate Carcasses and Their Paleobiological Implications. University of Chicago Press, Chicago. I'd recommend Brand et al. (2003 a&b) as also good references on actualistic taphonomy. Brand, L. R., Hussey, M., and Taylor, J., 2003a, Decay and disarticulation of small vertebrates in controlled experiments, Journal of Taphonomy, 1 (2): 69-95. Pff, science it up all you like PhD boy but that ain't no raccoon - that's a mutated eagle-turtle hybrid, and why is the government covering up the truth eh? Sorry, rookie mistake - I should have thrown a few speling mistaikes and exclamation marks in there to be a bit more convincing!!!!!! Thank god there are sensible people out there like you to deal with this kind of dross...I saw an episode of Jesse Ventura's conspiracy theory show a while back where he basically states the Montauk monster is some kind of diseased government experiment escapee from Plum Island, and pretty much everyone he interviews agrees this is a wholly credible explanation. Hopefully some of them watch Discovery. IF YOU LEAVE A MAMMAL CARCASS IN THE WATER, THE HAIR WILL FALL OUT. That's not enough to let you identify the M.M. as a raccoon (you have to know a bit about the comparative anatomy of raccoons and, say, dogs to do that), but even knowing that much, I think, will save you from assuming that a hairless carcass washed up on the beach has to be a mutant or a sea monster! Generalizing: Ph.D. level zoology is needed for the details (I recall discussion of an upstate New York monster carcass on Tet Zoo where the question came down to "otter or mink? "), but the wild misinterpretations that lead to media frenzies about things like the M.M. could be avoided by a combination of basic epistemological common sense (like: TRY TO THINK OF AN ORDINARY EXPLANATION BEFORE GOING PUBLIC WITH AN EXTRAORDINARY ONE) and pretty basic zoological lore. This is what comes from citified yuppies whose only exposure to 'dead animals' is the meat they buy from the supermarket. I'm honestly shocked that this thing is even still getting discussed (by real scientists like Naish or by conspiracy theorists), and it irks me that despite Naish's excellent writing, the only people likely to pay attention to his debunking are the people who are already too educated to mistake a rotting carcass for a 'monster'. Incredible: this afternoon I read this article and now I'm seeing you in National Geographic Channel! Frankly, that carcass doesn't seem all that leggy to me. 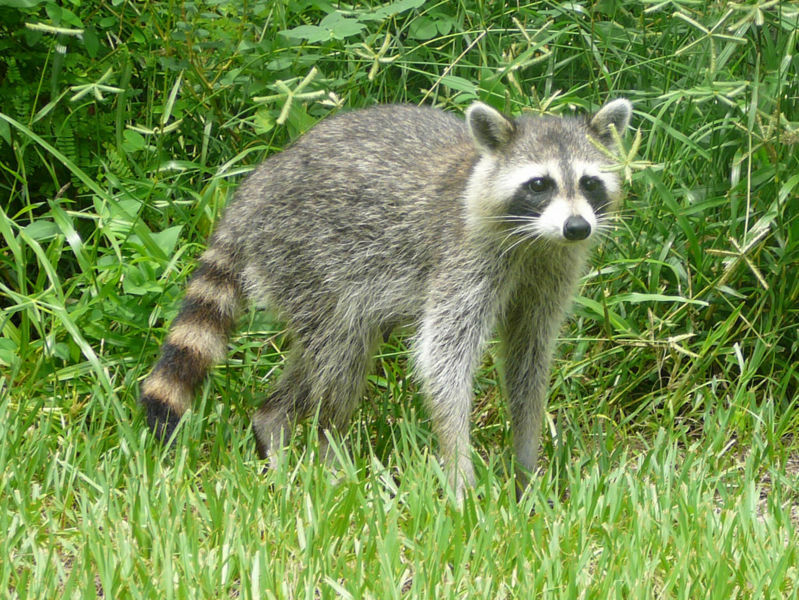 anthroscienceguy: The raccoon in your picture appears to be a relatively young animal. Individual variation is, of course, something Naish has touched on before and is definitely a factor in this. This carcass appeared some time ago on monsterquest. It was shown on the Jersey Devil episode. The idea of it coming from Plum Island was mentioned, as well that is was a relative of the Jersey Devil. In the end it was identified as a kind of dog. Just because this is a dead racoon doesn't mean they're NOT bioengineering radioactive mutant chupacabras out on Plum Island. Hey, I heard that BBC is redoing walking with dinosaurs and making it into a 3D movie. Its supposed to come out in 2012 and cost about 40 million pounds (about $65 million). Any news on this. Maybe Darren can make an article about WWB the show right before it comes out. "Pff, science it up all you like PhD boy but that ain't no raccoon - that's a mutated eagle-turtle hybrid, and why is the government covering up the truth eh?" Role Models in Expo's 'Meet the Scientists/Engineers' Are Ready to Inspire Your Kids! Another Amazing Opportunity for Teachers Too! Weekend Diversion: The World Beard and Mustache Champions!